Pakistan has become, according to the vision of its founder, a laboratory of Islam. All regimes in Pakistan regardless of their political ideology and democratic dispositions have relied on Islam as a legitimizing force. The military government under General Ziaul-Haq, which assumed power in 1977 after displacing the civilian government of Zulfiqar Ali Bhutto, adopted Islam as its sole legitimacy and set forth an all-inclusive overhaul of policies and systems according to the Islamic law - a process termed "Islamization". While education policy, foreign policy, and media policy received special attention under Islamization, economic policy remains the classical case. 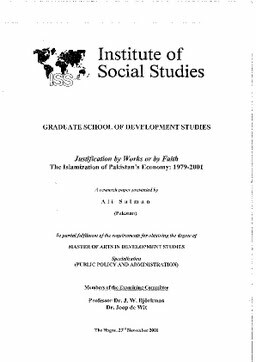 Referring these economic reforms as the 'Islamization of Pakistan's Economy', this essay discusses their underlying behavioural, political and socio-economic reasons and analyzes their outputs and outcomes.